Your router sits on your network like any other computer. Most routers — Apple’s AirPort Express is an exception — put up their own Web site on your local network that you access with any Web browser, such as Safari. You configure the router through this Web site. Don’t confuse this Web site with the router manufacturer’s Web site, such as www.linksys.com. The one you use to change settings is literally inside your router and is only accessible from computers on your local network. 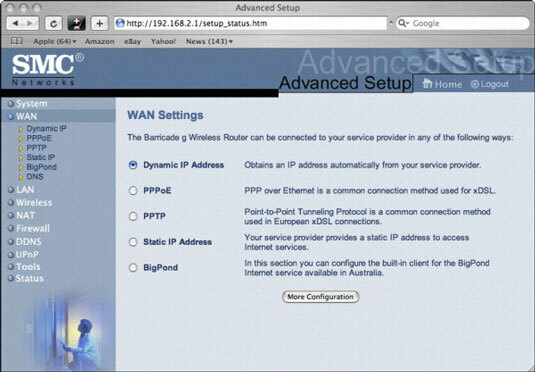 Open your Web browser and type your router’s IP address into the address bar. So, for most SMC routers, you type 192.168.2.1 in your browser’s address bar to access the router’s Web page. When the router’s logon screen appears asking for a password and, on many models, a username, enter the information that’s requested. If you assigned a password and forgot it, the simplest thing to do is to reset the router. However, you will lose any configuration information, such as game ports, you had previously set up. You might first try one of the common default passwords: admin, password, 1234, 12345, and none (that is, leave the password field blank). If all else fails, try resetting your router. After the router’s logon screen, you go to a mini Web site with many pages where you can change settings. When you’re done, save your settings and exit your router’s internal configuration page. Exactly what you can do on a router configuration page varies by model, but common capabilities include setting a new username and password; configuring how your router connects to your high-speed Internet modem; turning on or off a built-in firewall; allowing certain ports to be visible through the firewall; and setting parental controls.